I rarely think about all that goes into my food. 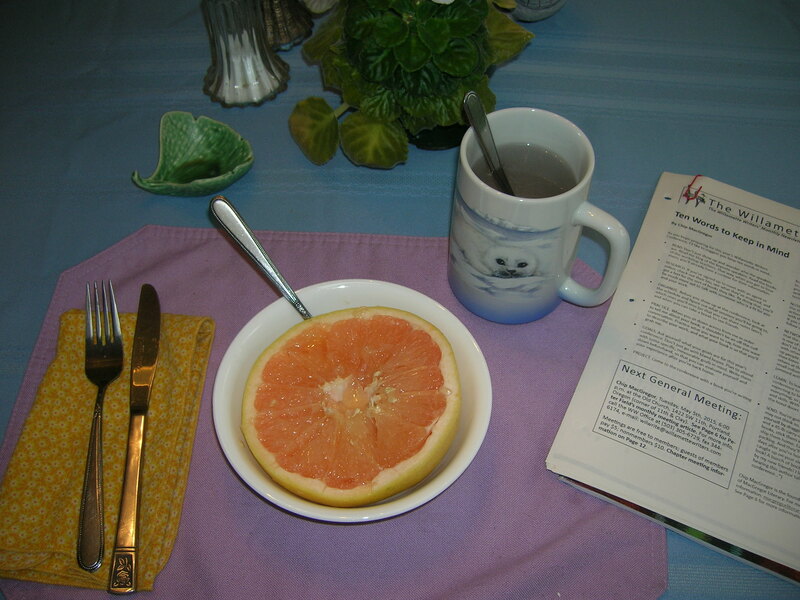 I am usually reading a book as I eat, but today as I stop to say thank you for my breakfast of half a ruby grapefruit, homemade bread and herbal tea, I consider the complex origins of this simple meal. This fat juicy grapefruit grew on a tree from seed to green fruit to ripe, heavy fruit that someone picked off the tree in Florida, put into a box and shipped all the way to Oregon, where it came to the Thriftway Market in a truck to be placed in the bin by the man with the green apron for me to squeeze and find worthy to go into my shopping cart. This morning, I removed it from my refrigerator, cut it in half, placed half in a container to save for tomorrow, half in a small white bowl, cut around the edges with a sharp knife, then sat at my table to savor the fat juicy bites that wake my tongue and call saliva from the back of my mouth. What if this grapefruit had fallen to the ground, to be bruised and eaten by bugs? What if the sun wasn’t warm enough or it rained too much? It would not be here on my table now. As I finish eating my grapefruit, the tea kettle squeals. I pour boiling water over a Red Zinger tea bag, watching the water turn red. This tea is a blend of rose hips, licorice, chamomile and other herbs grown in sun and rain, harvested, dried and blended in a factory in Colorado, put into filmy paper bags and a box that ends up at the market for me to buy, brew and drink at my table. Afterward I will throw the bag away, its contents squeezed until they run white. What a miracle that I have this tea every morning to drink. My bread took four hours to make a few days ago. With blues playing on the radio, I mixed yeast, flour, sugar, oil, water and salt into a big lump which I kneaded with my hands, let rise, shaped into braids, let rise again, and baked. Each ingredient was grown and processed by someone, sold to the grocery store and sold to me to be combined into this mouth-pleasing substance that I warm one slice at a time in the toaster oven and spread with a butter substitute made from yogurt, oil and other ingredients, each harvested, cooked, shaped and packaged far away. Each bite is soft in the middle, crunchy on the outside, slippery on top, satisfying to my body and soul. So much effort, so much life, has gone into this food that I eat at dawn, the smallest and least complex of my meals. Although too many people have nothing to eat, I never question that my food will be there every morning, that when I run low I can go get more. How dare I not pay attention when I should be thankful and awestruck with every bite? Next Next post: What’s Just Around the Bend?